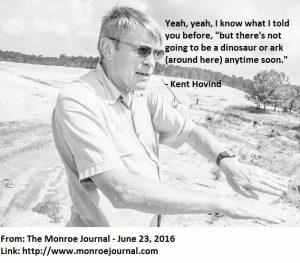 Kent Hovind’s Terms & Conditions – Kent Hovind v. Robert Baty – The Great Debates! This seems to me to be pretty good evidence, further evidence that is, that Kent is intent on continuing his tax cheatin’ ways while trying to do all he can to try and make himself look legitimate. Maybe it will work for him; maybe not! Everyone at Dinosaur Adventure Land will sign this agreement along with supplying their contact information for CSE Ministries record keeping. I am a born again Christian. I will be on properties owned by Creation Science Evangelism Ministries, Inc. (hereafter CSEM, aka Dinosaur AdventureLand) / Creation Science Evangelism Inc. (Hereafter CSE) at the direction of God. I desire to serve God at this Ministry. I have notice that CSEM, CSE, and Dinosaur AdventureLand are Florida Corporations, one for profit, one DBA, and one not for profit are Ministries with a mission statements and I desire to serve God in volunteering, becoming a vendor or both in advancing the missions of each Ministry. I serve as an Ambassador for God in my capacity to serve God at these Ministries and properties. I serve as an independent Missionary. I am not an employee or agent of any kind of the Ministries or entities. In further consideration for participating on the properties, or buildings, I assume responsibility for all my actions while at any location, and on acreage, facilities, traveling to and/or from any such facility, or being engaged in an activity and/or under any supervision of any adult team leader, and/or vendor or other volunteers. I assume responsibility for physical loss or injury or theft or damage of any kind to others caused by my negligence or intentional acts. I acknowledge that video, and audio recording takes place from time to time on the property and I release the use of my image for that filming. I will not, without specific signed waiver, do any audio or video recording of the principals, volunteers, vendors, and/or people on the property or in travel for any publication or use in any way. I AM HERE AFTER PRAYER AND UNDER DIRECTION FROM GOD. THIS IS A WORK FOR GOD; I am here at His direction and under His protection and expect no coverage of any kind for loss or injury of any kind. I hereby assume all responsibility for any and all risk of property damage, bodily injury, theft, and any kind of casualty loss, that I may sustain while participating in any volunteer, vendor, work or Ministry effort, exercise or other activity of any nature, including the use of equipment or facilities of these organizations. 1. I AM NOT AN EMPLOYEE of any of these Ministries or entities. There is no employer/employee relationship, unless specifically noticed. Any contractual agreement will be by separate Article 1 section 10 U.S. Constitution contract. Unless noted by specific and separate contract I am totally independent volunteer. 2. I AM AN UNCOMPENSATED VOLUNTEER. 3. RIGHT TO REFUSE ANY ASSIGNMENT. Although I will take directions and will follow those directions. I withhold the right to refuse to do any work for which I am not qualified or under qualified or that causes me any fear. I will communicate my desire not to be involved in any activity that I wish to refuse. I can walk off any job at any time. I am an uncompensated volunteer. 4. I realize that the Ministry has limited space for limited volunteers and I may not be able to be used by them at this time. If I am replaced, that does not mean that I am unsatisfactory, it may only mean that another person more qualified than myself has been chosen at this time. I certify myself physically fit to serve in any requested capacity or I will notice in writing if I am not. I currently have no known mental, medical, health care or other physical condition to stop me from serving or I will immediately give notification and apply my right to refuse such activity. ASSUMPTION OF RISK OF INJURY OR LOSS. In consideration for my rewards in Heaven for serving God, I choose not to have insurance or I choose to provide my own Health Care or Injury insurance during my service at the Ministries. If my actions cause injury or loss to another by mistake, negligence, or intentional act, I agree to compensate the person or reimburse the Ministries. I agree to hold the Ministries harmless. I agree to pay all compensation, losses or Attorney fees of any kind that result from my actions. I agree not to be involved under any capacity as a party to any litigation or action against CSE/CSEM. I AGREE THAT ANY ACTION FILED AGAINST THEM SHOULD NOT BE ALLOWED AND SHOULD BE DISMISSED AS TO THESE ORGANIZATIONS. Further, I expressly agree that this document and its provisions of release, waiver, and indemnity agreement is intended to be as broad and inclusive as permitted by the State of Alabama, and that if any portion thereof is held invalid, it is agreed that the balance shall notwithstanding, continue in full legal effect. Further, I, for myself and my heirs, executors, administrators, and assigns, hereby release, waive, and discharge all Ministry Organizations, their officers, consultants, vendors, directors, agents, and other volunteers of any and all claims ever arising in connection with such volunteer work. I hereby waive such claims, demands and causes of action. I AM HERE ONLY UPON MY GOOD BEHAVIOUR. I will follow all rules and directions of the organizations or exercise my right to leave at any time. IF I FAIL TO FOLLOW DIRECTIONS OR IF MY ACTIONS WOULD HARM MYSELF OR ANOTHER> I MAY BE ASKED TO SERVE GOD ELSEWHERE. I AM A VOLUNTEER TO DO PHYSICAL LABOR. I will not hinder others. I desire to serve God and not be slothful, rebellious or unsatisfactory in my work or actions. I am here in personal service to God as my only purpose to be here. I have carefully read this terms and conditions as it appears on the web site where it is current and updated. I understand it fully and have agreed to it. I sign the waiver of my own free will. I am at least 18 years of age, and/or I am the Guardian of under age children under my supervision. Creation Science Evangelism Ministries, Inc. is a non-profit 501(c)3, public charitable status 509(a)2 with a EIN# 81-1424226. Creation Science Evangelism, Inc. is a for profit Corporation donating profits each year to CSEM, Inc. Dinosaur Adventure Land is a DBA. All serve as ministries with the common mission and goal stated here. We host regular services for the Church body, and therefore are a Church as established by Jesus Christ. CREATION SCIENCE EVANGELISM MINISTRIES, INC.
Name: SPIEGEL & UTRERA P. A. Really Kent, what is going on with all the nominee entitites you are using to keep your money stream going. Based on the above 2 comments, it looks like CSEM is a non-profit Florida corporation (not-for-profit) and that CSE is the for-profit Nevada, not Florida, corporation. I did not find any such thing as “Dinosaur AdventureLand” as a “DBA” as far as any Florida or Nevada corporation. I suspect that the DBA is simply you, Kent Hovind, operating as a proprietor and making all the money you can under that name while trying to claim that the money is actually going to one or both of the other corporations. Of course, given your preference for secrecy, Kent, I can only speculate as the scheming going on and the various and sundry entities you may use as nominees to keep the feds from latching on to something and helping you pay down your $10,000,000 or so in debt. I look forward to finding out, Kent, how your antics might affect your promised request for early-out of your Supervised Release which you indicated you would be filing for in about 3 weeks or so. Would this pile of xxxx even hold up in a court case, any court case, Robert? My take is it is not worth much, if anything at all. I figure that if such issues were raised it they would be decided based on the “facts and circumstances” and not contrived “because I say so” arguments. Organizations can certainly have volunteers that get some nominal “benefits” without being classified as “employees”. Kent may have some of those as well as others who may try to be put in that category by Kent, but such an effort might fail if properly called into question and properly developed. There is plenty of case law dealing with specific “facts and circumstances” regarding such things. Maybe Kent will eventually have his case added to that historical record. I just noticed these additional claims on Kent’s 2peter3.com website! public charitable status 509(a)2 with a EIN# 81-1424226.
profits each year to CSEM, Inc.
Dinosaur Adventure Land is a DBA. All serve as ministries with the common mission and goal stated here. Kent is welcome to “host regular services for the Church body” as he sees it and claim he is a Church, but that does not make any of his business operations a church for tax purposes.